Human eyes are relatively effective at ‘seeing’ colors. The cells required to do so, known as cone cells, are packed into our retinas in great perfusion. Therefore, we can convert light that bounces off the objects around us into the various colors that they represent. Our cones come in red, green and blue subtypes, but their activation is processed into hundreds of different shades based on the differing proportions of these basic primary light colors that hit our eyes. This results in a huge range of colors that we have characterized. Then again, the wavelengths that correspond to this palette make up a spectrum that is restricted in terms of all the light types that actually exist on Earth. We think of this limited range as visible light. Their less visible counterparts include infrared, near-infrared and ultraviolet. We know these exist as they elicit feedback in certain instruments designed to detect them. Additionally, in the case of ultraviolet, we think of it as a force of nature – one that can cause changes in our skin chemistry and DNA, no less. However, we fail to appreciate that some things on Earth actually reflect ultraviolet (UV) light as well as visible light. This goes unnoticed by us, thanks to the triple-cone (or trichromat) nature of our eyes. But it turns out that there are other cone types that can, in fact, see UV as a color. They evolved over time in other types of organisms, most notably birds. It appears that this occurred to allow avian species to ‘see’ an additional dimension of color in the leaves of dense forestry or shrubbery. This additional cone is known as U, which stands for ultra-short-wavelength light. It is joined in this category of ‘alternate’ cones by the V cone, which is specialized for the improved perception of violet light (which corresponds to a wavelength just beyond that of blue light). This cone replaces the U-type in some birds, depending on their adaptability and environment. Therefore, it is now thought that nearly all bird species have four types of a cone each, i.e., tetrachromats. This conformation may confer extra advantages to birds while in flight, but can compromise on visual resolution and night vision compared to other living beings, humans included. It would be interesting to see the world as a bird does. However, that would be largely impossible for us to do with complete accuracy due to our simple inability to see UV light. A pair of scientists, Cynthia Tedore and Dan-Eric Nilsson, developed a novel, specialized system of camera filters that added either ‘V’ or ‘U’ visual data to the images taken with the optical hardware in question. They completed this work at the Lund Vision Group, a division of Lund University in Sweden. The team achieved this by calculating the average wavelengths that each individual avian-cone can use. These were converted into transmittance spectra that could be used by custom camera filters manufactured by the American company, PIXELTEQ. These spectra were also corrected for the transmittance and sensitivity spectra of the lens and sensor used, and also in relation to the corresponding camera channels of the other three cone filters. The data resulted in images of typical avian habitats that may come as close as we can to seeing such sceneries as birds do. The resulting images did indeed show that leaves, which normally appear to be a uniform green to us, shade into what came across as a kind of dull, off-violet to the artificial ocular set-ups with four channels representing the red, blue, green and UV cones. The effect was indeed one of increased contrast, which almost makes a given image look more three-dimensional than usual. This additional layer of visual detail may help birds find their way through thick, poorly-lit vegetation, or to tell one kind of tree from another. 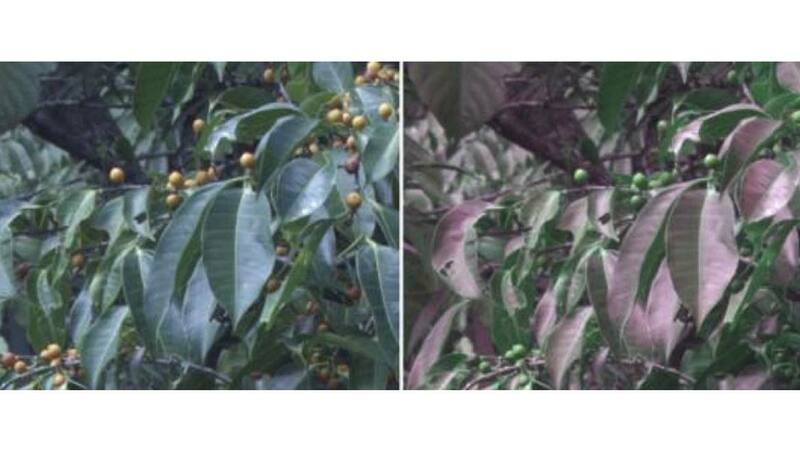 Tedore and Nilsson also established that much of this U-cone-related ‘color’ was present as a result of light from the sun or sky reflecting off glossy leaf surfaces (also explains why there was so much UV light to ‘see’ in the images). This form of light, termed specular reflection, had often been overlooked in studies on the same subject, as it accounts for only 1 or 2% of all UV light that hits the average leaf. Despite this, it created enough radiance to be clearly apparent in the Lund duo’s filtered photography. It now appears that this specular reflection accounts for much more of a bird’s ability to see in dense vegetation than previously thought. Tedore and Nilsson now recommend that earlier studies on avian cones and how they allow birds to perceive the world should be re-evaluated in light of this discovery. In the meantime, we must appreciate this new level of insight into avian life. Battery Pharma: Can Genetically Modified Chickens Really Produce Viable Medicines?